This will be the last article you will receive from me as Commander of the Council of Kadosh. It has been an Honor, a privilege, and most definitely an experience occupying this chair in the east. It was only with the help of the other officers and the support of all the Brethren that I was able to make it through the year. I wish to thank each and every one of you for all your help, support, and for all those smiles that make life worth living. Seeing all those familiar faces and getting to meet and get to know new ones is always a new thrill for me. As my family grows, so does the good feeling within me grow. Thanks again for being you and being there. There were several awards given in our last stated meeting. Two of those were for Brothers which had been in Scottish Rite for more than 50 years. I congratulate them and envy them. 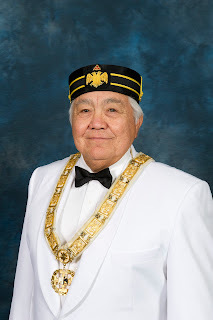 I especially want to thank Most Worshipful Holsinger for putting into words my feeling about being a Scottish Rite Mason. By the time you read this, the Holidays will have passed, the wrapping paper and all the trimmings have been properly stored and things have begun to return to normal. The hang-overs are beginning to fade away but the headache of knowing that those bills have to be paid still lingers. Another thing always comes to my mind. The Holidays and the month of January almost always bring with them a larger than normal amount of accidents and need for blood. Giving blood at Red Cross or any approved donor station is one very good way to serve your brothers, sisters and community. See you out there.